Just in time for a last minute Christmas gift (or something special to treat yourself), a new sock pattern: The Visions of Sugarplums Sock Collection! 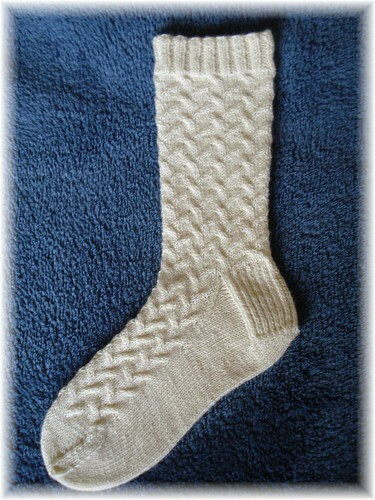 Two, top down sock designs are included in this pattern. Stitch patterns for both designs are shown in chart and written out format, making these accessible to any knitter. Perfect for a last minute gift, or for getting a jump on next year's knitting, these socks are fun to knit and easy to wear. 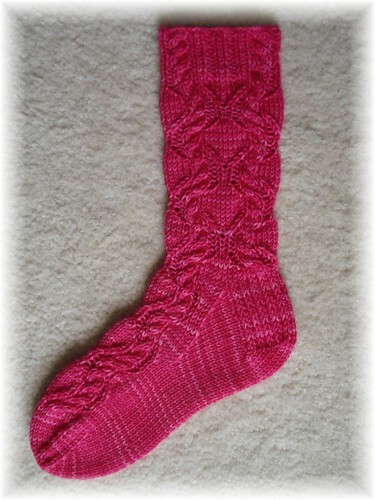 This sock collection was the pattern for The Yarn 4 Socks Sock Club in December of 2008. 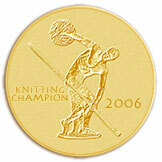 Not much knitting has been happening around here. I'm still working on Mindy's Christmas sweater, but I won't bore you with pictures right now. I'll get a picture of it all finished and show you later. I have one last pattern for 2008 and that will launch on Monday, but I think otherwise I'm going take a blogging vacation until next year. I know everyone is running around like crazy right now, so I seriously doubt any of you will miss my babbling. I hope you all have a Merry Christmas, Happy Hanukkah, and a Joyous Festivus! I'll see you in 2009! Add several buttons (3?) starting where the tie is in the picture and ending just below the bust line. 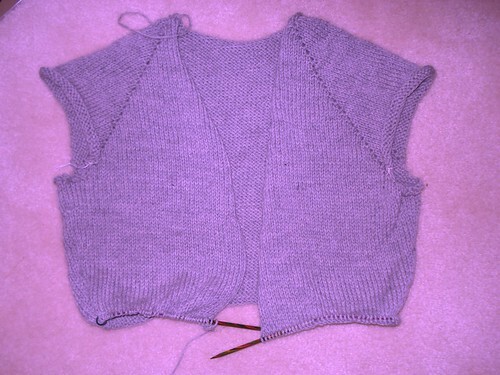 Do the side decreases only to a point below the bust, then start increasing, making the cardi A lined with an Empire type shape. Eliminate the side shaping all together. Make the cardi longer - duster length might be cute, but I'd definitely add more increases over the hip area and probably the 3 button idea just to give it more support at the top. Do 3/4 length sleeves (I love 3/4 length sleeves - they don't get in the way of real life). Seriously, I could just keep going. This is one of those basic patterns you can plug in your own changes to. You could even change the stitch pattern up some. I think you could knit 5 of these and no one would have to know they're all the same sweater pattern (OK, you could probably knit 50 of them and if you keep changing things up, it would still work). First of all, if you requested an additional download link through PayLoadz over the weekend for a pattern you purchased previously, could you request it again? It accidentally got tossed into the spam bucket and I didn't see it until after I had hit the delete button. This is what happens when retailers feel sure you're dying to buy their junk if they just send you 20 emails and I sort through them uncaffeinated. I apologize for deleting your request but I can't seem to find it in PayLoadz without the email. I hope everyone here in the US had a great Thanksgiving, and if you're not in the US, I hope you had a great week last week too (even though you probably didn't eat as much as we did). I appreciate you guys bearing with me on the long stretches of blogging silence right now. I'm still going to blog when I can (and when I have something to say), but that might be only once a week or so. I do plan to begin blogging M-F again once we get moved and settled in a bit, but until then, thanks for hanging in there. Ravelry is now allowing pattern sales through their site so I have set up my patterns there as well as here on the blog. The only thing that is a bit funny is that the patterns with multiple designs in a single purchase (many of mine are like this), are listed twice. For instance, if you like the Lava Flow socks and purchase them, you get the complete Fire sock package which is the designs for the Lava Flow socks and the Fireside socks. I did make notes of this in the pattern description, but it might be a bit confusing. As I mentioned, I will still be selling the patterns here on the blog, but I thought having them on Ravelry might expose the patterns to people who don't know about or read my blog. Also, when you're aimlessly wandering around Ravelry, looking at designs, it's easier to purchase them there, than to wander back out to the Internet and purchase them. And just in case you were wondering, Georgina Bow Creations patterns are also available on Ravelry. I'll be back later this week to show progress on Mindy's Christmas sweater. I'm off to work on Christmas cards now.